No-one really wants to get sick or injured and jeopardise their financial security, but sometimes bad things just happen. And it’s better if you’re prepared. AMIST Super member, Jordan Saufoi, is a good example of this. Jordan was out playing touch football with some mates one afternoon. There’s nothing unusual about that. When the evening set in, Jordan and his friends decided to head home. In the darkness of night, Jordan didn’t notice that the grate of a drain was missing. As he realised he was falling, he leapt forward but caught his left foot. The result: a multiple break of the left ankle that required surgery and metal pins. 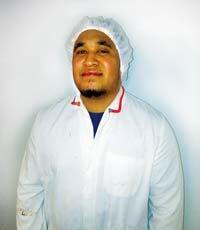 Jordan, who stands on his feet all day making burger patties at a food processing company in Queensland, has been unable to work since. Fortunately, Jordan’s AMIST Super income protection cover has kicked in and is providing him with $2,000 per month before tax while he recovers. Admittedly, if Jordan had increased his cover, he’d be receiving an even greater benefit than he is now. But even on the default level of cover, Jordan is smiling. 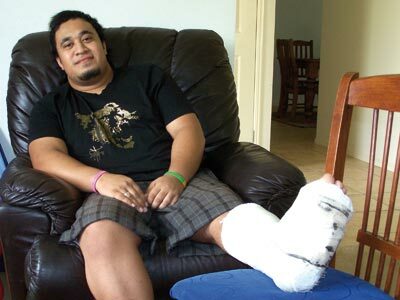 When Jordan returned to work, his ankle continued to give him grief, so he went back to the doctor. An x-ray revealed that the pins were not sitting correctly, so poor old Jordan went back into hospital for another round of surgery and another six weeks off work. As soon as this happened, Jordan’s Income Protection payments started once again and continued until he was able to return to work. Because Jordan had not even been back at work a month, there was no further 30 day waiting period required. The payments started immediately. Having automatic Income Protection is a really valuable benefit that AMIST Super offers its members. But it is also important that you review your level of cover from time to time. Remember, your Income Protection insurance can cover up to 75% of your pre-injury or pre-sickness pay, so when your pay increases, you might want to increase your cover to match. To get some advice on the level of Income Protection insurance that’s right for you, why not give our in-house financial adviser David S a call. You can reach him through our Hotline number and he’ll be happy to show you precisely what your options are and make some helpful recommendations. 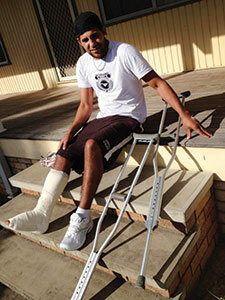 Ronaldo Costa is a Brazilian who has been living and working in Australia on a temporary visa for the past few years. He and his friend, Marcilei, who comes from the same Brazilian region, worked together at JBS Australia Beef City in Toowoomba until Ronaldo moved to Scone in NSW. Regardless of the distance between them, Ronaldo and Marcelei kept in regular contact with each other. A new job opportunity at Oakey Abattoir meant that Ronaldo was making arrangements to move back to Toowoomba when disaster struck, he broke his foot. The injury prevented him from taking up the new position which in turn, presented the next serious problem—money. Being on a temporary visa meant that Ronaldo was not eligible for any Centrelink benefits. He had no income options other than working, which he was suddenly unable to do. Concerned for his friend’s welfare, Marcelei reminded Ronaldo that because he works in the meat industry and is a member of AMIST Super, there may be an opportunity to make a claim on his income protection insurance. Income Protection is a type of insurance that can replace up to 75% of a member’s pay if they become sick or injured and can’t work. AMIST Super members automatically received this insurance in 2010. Because English is not his native language, Ronaldo did not even realise he had income protection insurance, so Marcelei downloaded the claim forms from the AMIST Super website and helped his friend fill them in. Even though Ronaldo was between jobs, his claim was approved and he started receiving benefit payments after the normal 30 day wait period. Although he has only the basic level of cover, Ronaldo has since received over $8,000 in payments which has certainly helped with his regular expenses. Ronaldo understands now that he can increase his level of cover to match his income, which would have been of even greater benefit to him. He plans to discuss this with his AMIST Super Member Services Manager when he returns to work. And because AMIST Super now has several fact sheets in multiple languages (including Portuguese), Ronaldo is able to make decisions based on complete information. Have you checked your level of Income Protection insurance cover lately? If you earn more than $40,000 per year and you haven’t taken out more than the default level of insurance, chances are you’re under-covered. 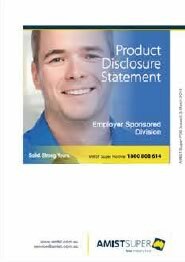 Check your statement or call 1800 808 614 to find out how to increase your income protection. Ronaldo Costa é brasileiro morando e trabalhando na Austrália com visto temporário nos últimos anos. Ele e seu amigo, Marcilei, vindos da mesma região do Brasil, trabalharam juntos na JBS Australia Beef City em Toowoomba até Ronaldo se mudar para Scone em NSW. Apesar da distância entre eles, Ronaldo e Marcelei estão regularmente em contato. Uma nova oportunidade de trabalho surgiu no Oakey Abattoir o que fez Ronaldo organizar sua volta à Toowoomba quando aconteceu um acidente, ele quebrou o pé. O acidente não o permitiu começar no novo trabalho o que gerou um novo problema sério — dinheiro. Tendo um visto temporário Ronaldo não é elegível a benefícios do Centrelink. Ele não tinha outras opções de renda além do trabalho, o que de repente ele não podia fazer. Preocupado com o bem-estar do seu amigo, Marcelei lembrou Ronaldo de que trabalhando na indústria de produção de carne e como membro da AMIST Super, poderia ter uma oportunidade de fazer um requerimento no seu seguro de garantia à renda. Garantia à renda é um tipo de seguro que pode substituir até 75% do salário do membro em caso de doença ou acidente o prevenir de trabalhar. Os membros da AMIST Super recebem este seguro automaticamente em 2010. Inglês não sendo sua língua materna, Ronaldo não tinha se dado conta que tinha seguro de garantia à renda, então o Marcelei baixou os formulários de requerimento do site da AMIST Super e ajudou o seu amigo a completá-los. Mesmo com o fato de que Ronaldo estava entre um trabalho e outro, seu requerimento foi aprovado e ele começou a receber os benefícios após um período normal de 30 dias. Mesmo tendo apenas o nível básico de cobertura, Ronaldo desde então já recebeu mais de $8.000 em benefícios, o que com certeza contribuiu para suas despesas regulares. Agora Ronaldo entende que pode aumentar o seu nível de cobertura para ficar de acordo com sua renda, o que seria um benefício ainda maior para ele. Ele tem planos de discutir esse assunto com o Gerente de Serviços a Membros da AMIST Super quando voltar ao trabalho. E agora a AMIST Super tendo informativos em vários idiomas (incluindo português), Ronaldo é capaz de tomar decisões tendo as informações completas. Você tem verificado o seu nível de cobertura do Seguro de Garantia à Renda? Caso sua renda seja mais de $40.000 por ano e você não tenha aumentado o seu nível automático de seguro, as chances são de que você não está assegurado no nível adequado. Verifique o seu extrato ou telefone para o Orientador Financeiro no número 1800 808 614 para saber como aumentar sua garantia à renda.